This view from the left Navigation Camera of NASA's Mars Rover Curiosity looks back at wheel tracks made during the robot's first drive toward Mount Sharp on July 4, 2013. The base of Mount Sharp, which lies about 5 miles away, is Curiosity's main destination. NASA's Mars rover Curiosity has set out on its first big road trip, a long journey that will traverse miles of Red Planet scenery over the course of the next year or so. The 1-ton Curiosity rover took its first steps toward the foothills of Mount Sharp — a mysterious mountain that rises 3.4 miles (5.5 kilometers) into the Red Planet sky — on July 4, then made another drive in that direction on Sunday (July 7), NASA officials said. Mount Sharp "exposes many layers where scientists anticipate finding evidence about how the ancient Martian environment changed and evolved," NASA officials wrote in a mission update today (July 8). 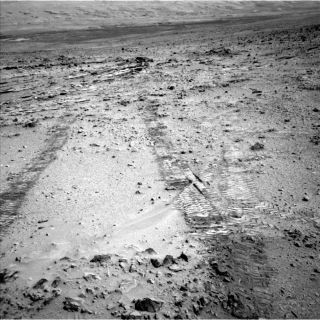 The two recent drives mark a big shift for Curiosity, which hadn't strayed far from its landing site since touching down inside Mars' 96-mile-wide (154 km) Gale Crater on Aug. 5, 2012, kicking off a two-year surface mission to determine if Mars has ever been capable of supporting microbial life. The six-wheeled robot accomplished a great deal without putting too much wear on its wheels. In March, for example, mission scientists announced that Curiosity had already checked off its main goal, finding that a spot called Yellowknife Bay was indeed habitable billions of years ago. The rover team took some time afterward to confirm and extend this discovery, and then completed a few other tasks near the landing site before hitting the road for Mount Sharp on July 4 with a 59-foot (18 meters) drive. The July 7 drive measured 131 feet (40 m), researchers said. Mission officials have estimated that the trek to Mount Sharp will take about a year, though they stress that there is no rigid timeline. Progress will depend on what Curiosity finds along the way, they say. "We are on a mission of exploration," Curiosity project manager Jim Erickson, of NASA's Jet Propulsion Laboratory in Pasadena, Calif., told reporters last month. "If we come across scientifically interesting areas, we are going to stop and examine them before continuing the journey." The car-size rover's top speed across hard, flat ground is about 0.09 mph (0.14 km/h).